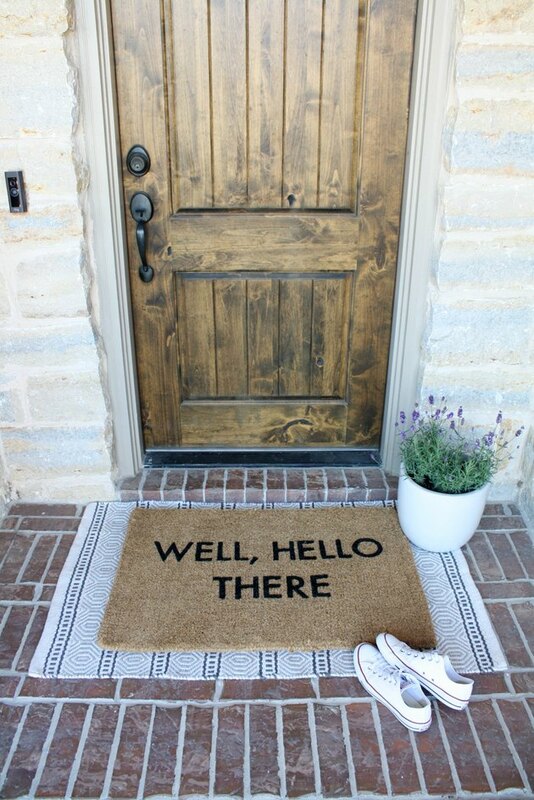 First impressions are lasting so make sure that your home's doorway is unforgettable ... in a good way. Put your best foot forward and take the opportunity to show off your charming personality and savvy sense of style right at your doorstep. How? 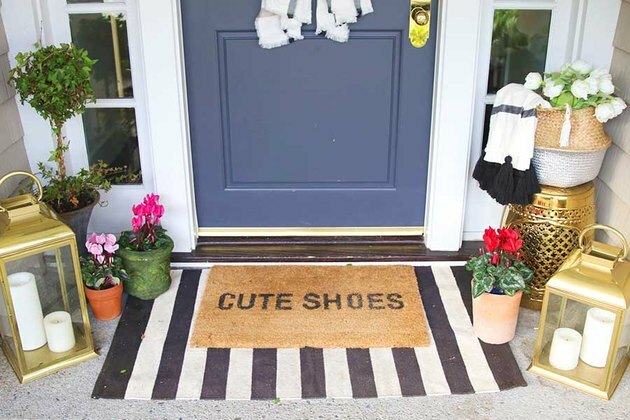 Quickly and easily, by layering your favorite cheeky doormat with a chic outdoor rug. Here are 10 impactful ways to pull off this hot new home decor trend. 1. Make a statement with millennial pink. 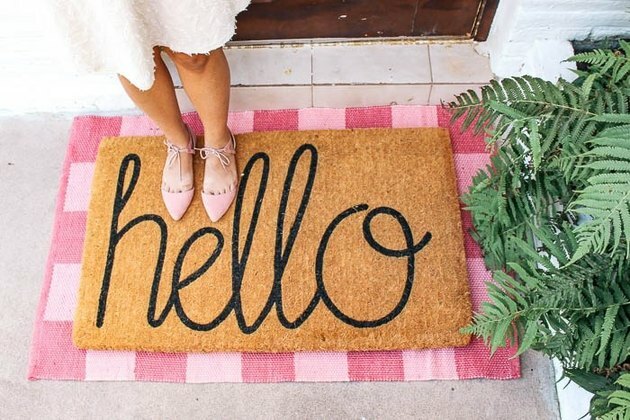 Ashley from At Home With Ashley transformed her lovely doorway by combining this uber-cute hand-tufted "Hello" doormat ( starting at $49 ) with a pink, buffalo plaid print rug ( $29 ). 2. You can never go wrong with classic black and white. Or if pink isn't your jam, black and white is always a classic. 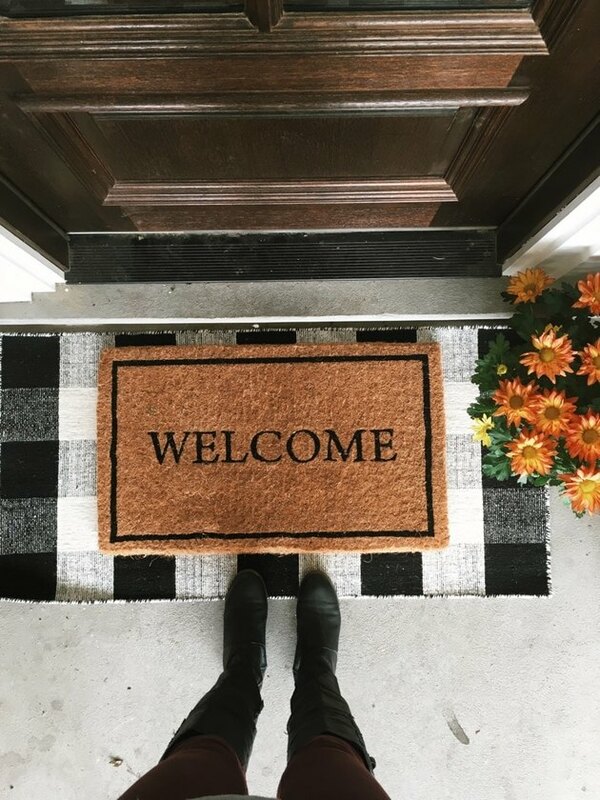 Chris and Julia over at Chris Loves Julia created their layered look with this "Welcome" doormat ( $24.99 ) on top of a plaid print, flatweave rug ( $22.39 ). 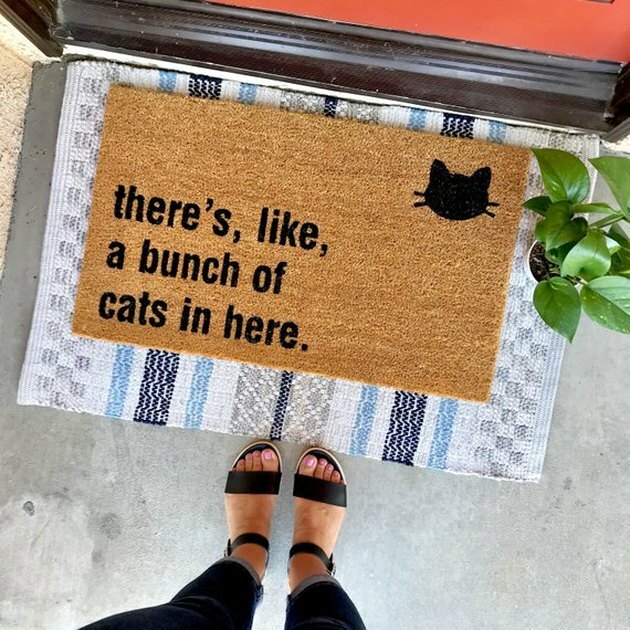 Since this rug will be outdoors, we would suggest using an option that's better suited to withstand the elements such as this PET (recycled polyester) option ( $29 ). 3. Floral motifs and stripes are a winning combination. We love the look of mixing patterns, like this Fern doormat ( $68 ) on top of a striped rug. 4. Neutrals are your friend. 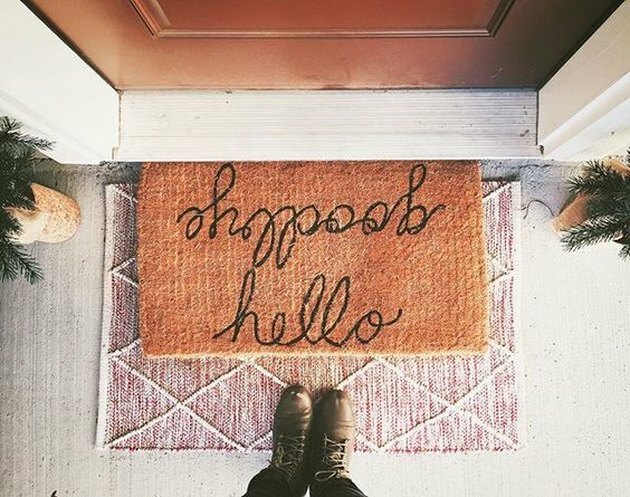 Incorporating a neutral rug beneath your doormat is the perfect way to subtly embrace the layered trend without taking away from your farmhouse chic porch. 5. Bold stripes are timeless. You know what they say, a straight line is the shortest distance between an entryway that says, "meh" and one that says, "wowza" ... or something like that. 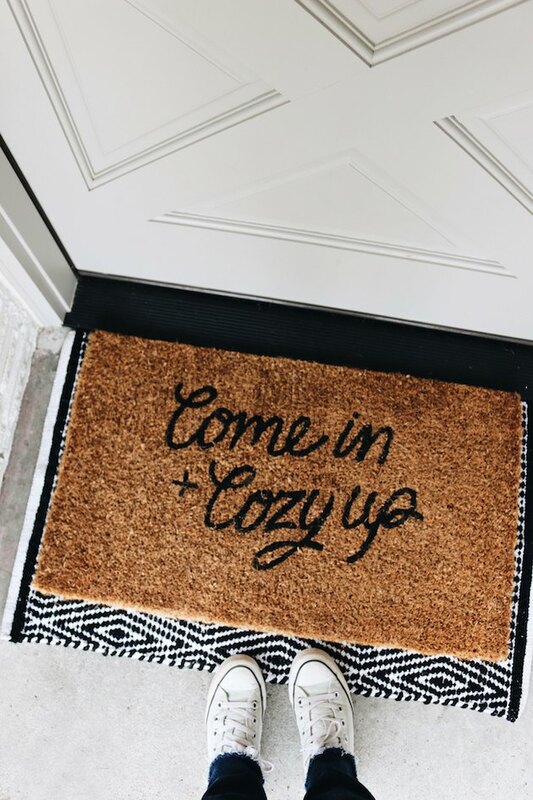 Ashley from Modern Glam proves this theory beautifully using a black and white striped rug ( starting at $19.95 ) beneath a charming doormat. For something that's a little more durable, check out this option ( starting at $43.15 ). 6. Bold geometric patterns make quite the impression. 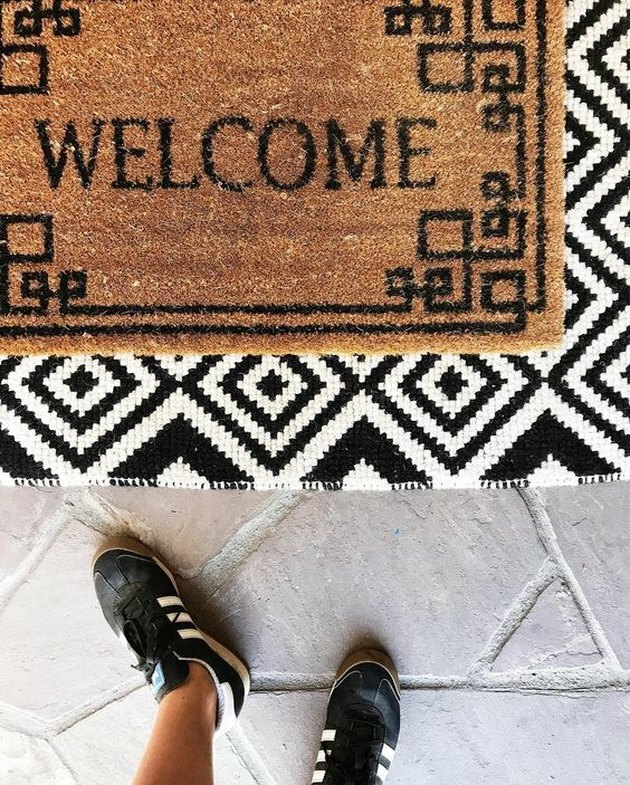 Reichel over at Copy Cat Chic, created this striking entryway by repurposing an extra rug she had lying around the house. Nicely done! 7. Cool bohemian vibes are oh-so-welcoming. 8. Sometimes less is so much more. 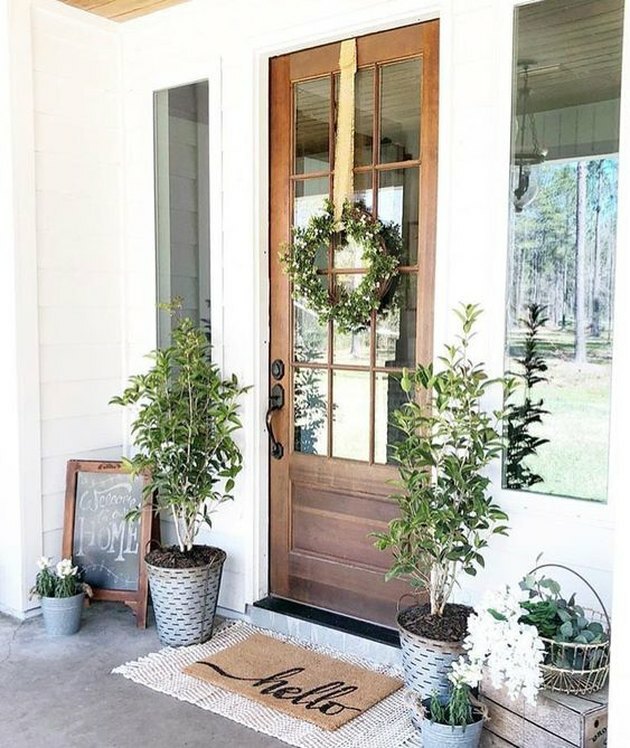 This simply stated rustic doorway is nailing the layered doormat look. 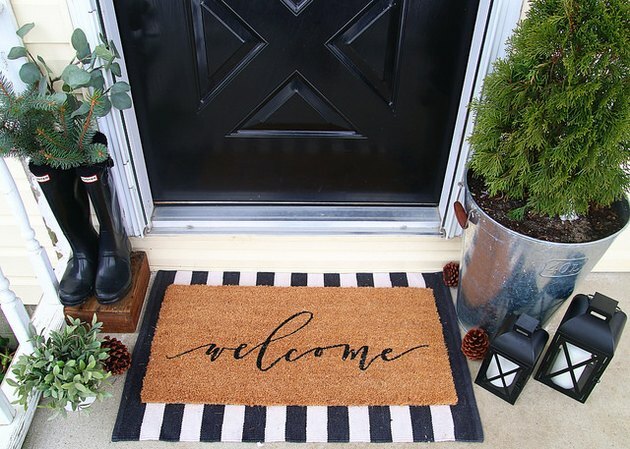 Inspired by Studio McGee, Shelley from Crazy Wonderful put her creative skills to work and made this adorable DIY doormat, which she framed with an elegant gray and cream, patterned rug ( $24.99 ). But we'd suggest using an option like this one ( $31.49 ) instead, that will hold up better outdoors. 9. Accessories can enhance your layered vision. 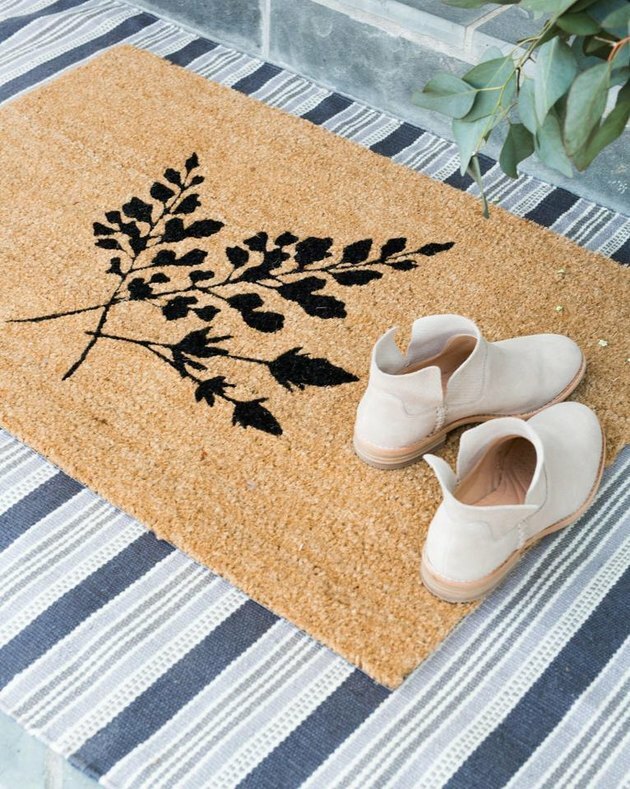 Erin from Elizabeth Joan Designs proves that the idea of layering can extend beyond a chic doormat — like this one from Magnolia Market ( $28 ) — and a coordinating rug — like this handsome striped option ( $43.15 ). By adding additional accessories to fill out your doorway, you can make a picture-perfect vision regardless of the season. 10. Stand out from the neighborhood crowd with a strong diamond motif. In the words of Rhianna your layered entryway will definitely "shine bright like a diamond" with this geometric pattern framing the front door.